Slice onions thin (I use a mandolin). Place sliced onions in a small pot filled halfway with water and bring to a boil for 2 minutes. Drain water and remove onions, placing them into a large mason jar. In the same sauce pan used for boiling the water, add vinegar, sugar, garlic powder, bay leaves and cumin seeds. Bring to a boil, reduce heat to a simmer and cover for 5 minutes. Bring liquid to a low-boil and carefully (!!!) pour hot vinegar on top of blanched onions inside the mason jar. Cover with a lid and let jar cool down to room temperature before putting it in the refrigerator for storage. Pickled onions will keep for 6-7 weeks in the fridge. The Rhododendron may be started from seed, however most home gardeners grow the bush from a established plants in full bloom from a garden store. The Rhododendron bush is transfers from pot in early spring or early fall. Rhododendrons grow best in light shade. The soil should be moist and well drained. To much wind or too much sun will damage and even kill the plant. Rhododendrons should be planted out of direct sunlight with protection from the wind. The cold weather can also damage the Rhododendrons. Add the butter, milk, sugar and cocoa powder to a 4-quart saucepan. Bring to a rolling boil and let boil for 1 minute. Remove from heat. Stir in the peanut butter and vanilla until smooth, then stir in the oats. Drop heaping tablespoons onto 2 wax paper-lined baking sheets. Let cool. Cookies should harden and set in about 30 minutes. 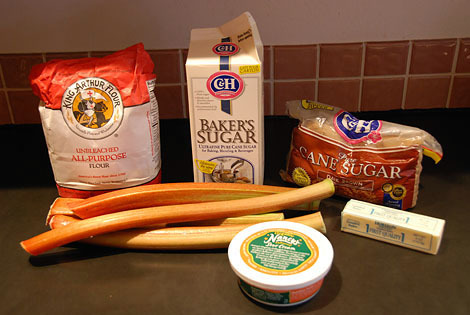 In a large mixing bowl, mix together the bread pieces, vinegar, and olive oil until they are well-combined. 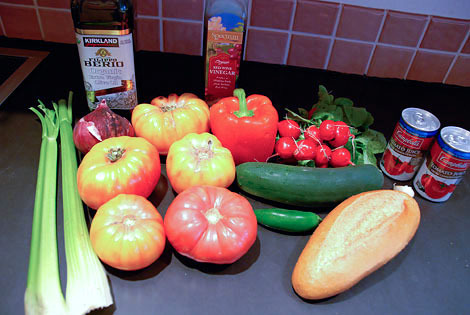 Add remaining ingredients, including reserved juice from the tomatoes, and stir to combine. 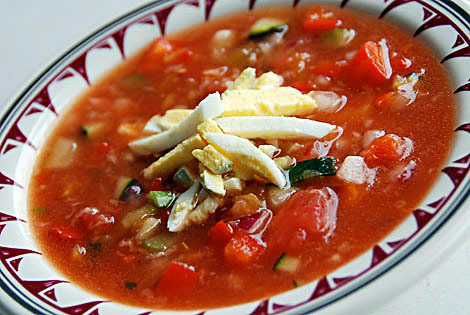 Serve gazpacho chilled with a garnish of hard-boiled egg if desired. I was introduced to this dish when some lovely ladies from church brought it over. The occasion was when I was in hospital unable to take care of my family as usual. This dish made a delicious supper for my family and was easy for the ladies to put together as well. Just take a look at the simple ingredients. Serving this dish is simple as well. It makes nicely in a casserole and can easily be served up. I suggest maybe a salad and rolls for dinner. Cook chicken breasts. I usually buy boneless skinless breasts to make it easier on myself. Bring chicken broth to a boil on the stovetop. Add chicken to broth and turn heat down to get the chicken broth to a low simmer – just moving, but not bubbling a lot. Place lid on pot and cook chicken for about 15-20 minutes or until chicken is white all the way through. If you use chicken strips, they will be ready earlier, probably after 10-15 minutes. If you’re using bone-in chicken pieces such as leg quarters, it will take longer – closer to 45 minutes. I like to cook extra chicken to really stuff the casserole with chicken and then use the leftover chicken for homemade chicken salad. Debone chicken breasts (if not using boneless) and cut them into small chunks. Heat cream cheese and cream of chicken soup until melted enough to be easily mixed together. Cream Cheese and Cream of Mushroom Soup melted Mix chicken into cream cheese/soup mixture. Place in 9×13 casserole dish or spread out into smaller dishes. If I’m not cooking the casserole right away, at this point I cover the dish in foil and place in refrigerator until ready to bake (not more than a day or so later). When ready to bake, preheat oven to 350 degrees (325 convection). Crumble one sleeve of Ritz crackers and mix with poppy seed. Sprinkle mixture over casserole. Poppy Seed Chicken ready for butter Melt butter and drizzle over the cracker topping. The original recipe calls for an entire stick of butter, but you can definitely cut back on this and still have a delicious casserole. Bake for 30-45 minutes or until bubbly. If you’re using smaller casserole dishes like I did, this will be closer to 25-30 minutes. Serve hot. There are times that I find it simply too hot to cook meals inside the house. We do not pay for air conditioning unless it gets too hot So cooking makes house hotter but using crock pot makes it easier. Put all ingredients in well-greased crock pot. Stir well. Turn on low for about 3 hours, stirring occasionally. Place a large (12") skillet or a Dutch oven over medium heat. Add the canola oil and onion; saute onions until translucent. 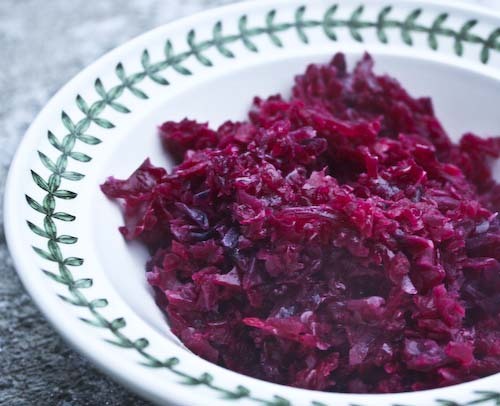 Add cabbage, vinegar, sugar, caraway seeds, and salt. Cover and simmer, stirring occasionally, until cabbage has wilted. Remove cover and reduce heat to medium-low. Simmer uncovered for 20 minutes. Finish with freshly-grated nutmeg to taste. Drive past any fast food restraunt and most 3 year old would know exactly where they are at. My grand-babies have enjoyed french fries every since they were old enough to eat them. 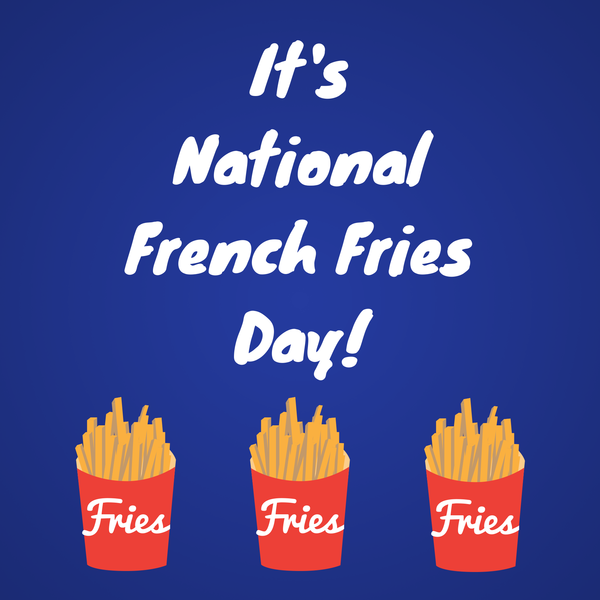 But, do we really know what a french fry is?? Where did they come from and when did they reach the U.S.?? French Fries (American English), Chips (British English), fries, finger chips (Indian) or French fried potatoes all refer to potatoes that are cut and fried or baked in the oven. Typically served hot, soft or crispy and eaten as part of lunch or dinner. They also make great snacks and are common place on fast food menu boards. Generally served with salt and ketchup. My kids love to eat them with ranch dressing others enjoy them with vinegar or mayonnaise. Some fries are served topped with chii cheese. President Thomas Jefferson was served "potatoes served in the french manner" at the White House for dinner in 1802. French fried potatoes are cut new potatoes in thin slices, put them in boiling fat, and a little salt, fry both sides of a light golden brown color, drain. The cooking term "french fried" was being used in the sense of "deep fried" and is used when cooking items such as onion rings. I believe it is a bit of both. While I often become the leader I get my inspiration from others thoughts as well as my own. 3. The Plaza Hotel (Eloise), The Land of Oz (The Wizard of Oz), Narnia (The Chronicles of Narnia), The Hundred Acre Wood (Winnie the Pooh), Wonderland (Alice's Adventures in Wonderland), or Never Never Land (Peter Pan)...which storybook land (on this list!) would you most like to visit and why? The Hundred acre Woods would be where I would love to visit. The beauty of the woods and the friendly characters draws my attention in that direction. I love how the characters work together if we had more of that in reality our world would be a much better place. 6. . 'Don't swim for an hour after you eat', 'Dog days of summer', 'Knee high by the fourth of July'...choose a summer saying from the list or share one of your own, then tell us what image or memory comes to mind when you hear it spoken. County fair is next week here where we live. As I looked through the exhibitors books I recalled going to show for many different projects. My mother always made sure we completed and helped us whenever we would ask. My question is did any of you compete at the county fair?? When my kids were growing up my relationship with my parents was at odds most of the time. My mother who did not talk to me very much and yet I know she loved me is still the same. My dad was the one that always tried and often brought watermelon to enjoy with my kids. My dad is long gone but those memories my kids hold of their grandpa and the melon are still very much present. 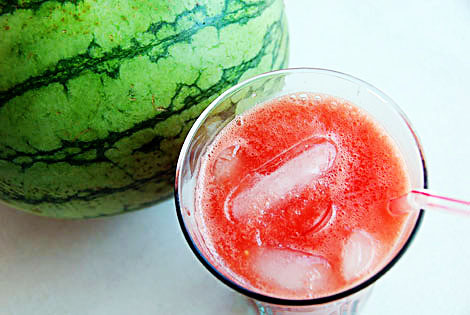 In a food processor or blender, puree cubed watermelon until smooth. Add lime juice and sugar; process until all ingredients are combined. To serve, fill a glass about 2/3 with the "base" of the spritzer. Fill the remaining 1/3 of the glass with sparkling water (leaving enough room for ice). Stir and add ice. Spillover Clean-up. As the filling starts to bubble, there may be some spillover. For easier clean-up, place one oven rack in the very bottom position. Cut a piece of foil that's slightly larger than the pie pan and turn up the edges all around it. Place the foil on the bottom rack, under the pie. Do not line the entire rack or the bottom of the oven with foil, as this will cause uneven heat distribution in your oven. In a large bowl, mix flour, seasonings and baking powder together in bowl, then beat in the eggs, lime and water. Stir until smooth, then add all other ingredients except for the oil. If mixture looks too wet, add a little more flour; if it looks too dry, add a little more water. It should basically look like pancake batter with chunks of veggies in it. Heat oil in a large frying pan over medium-high heat. Once oil is hot enough (simmering and smoking, but not boiling), drop spoonfuls of the fritter batter into pan like in the picture below. Fry for 2-3 minutes on each side, or until golden brown. Remove from pan with a spatula and set on paper toweled plate or cookie sheets. Allow to cool for at least 5 minutes before serving. Pecan pie is for you if you like nuts and love pie. Want something deliciously sweet then Pecan Pie Day is for you. You will find Pecan Pie on the menu of most diners and for a good reason. 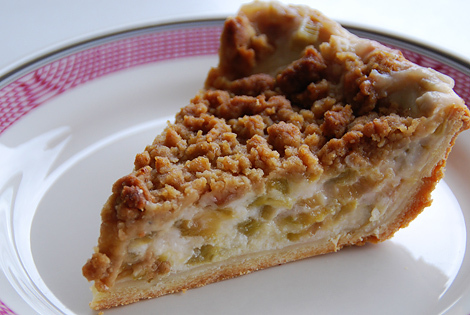 It seems that pecan pie is a very popular choice of dessert seekers. 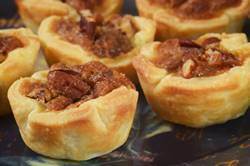 Today to celebrate National Pecan Pie Day try this recipe for pecan pie treats. Share with your friends or co-workers. If you have no time to bake head out to your local store or restaurant and pick up a pecan pie or pecan pie treat. Cream Cheese Pastry:In the bowl of your electric mixer, or with a hand mixer, beat the butter, cream cheese, and sugar until light and fluffy. Add the flour and salt and beat until incorporated. Divide the pastry into four equal portions. Flatten each portion into a round disk, wrap in plastic, and refrigerate for about one hour or until firm (can be chilled overnight). Preheat the oven to 375 degrees F (190 degrees C). Have ready two - 24 cup miniature muffin pans. Remove one round of the pastry from the refrigerator. On a lightly floured surface roll thepastry until it's about 1/8 inch thick. Using a round or fluted cookie cutter, that is slightly larger than the muffin cups, cut the pastry into rounds, and then gently fit the rounds into the muffin tins. Gather up any scraps of pastry and re-roll. (Each portion will make about 12 rounds of pastry.) Repeat with the other three disks of chilled pastry. Place the pastry lined muffin tins in the refrigerator while you make the pecan filling. Pecan Filling: Place the eggs in a large bowl, and whisk until lightly beaten. Then whisk, or stir, in the brown sugar, melted butter, vanilla, and salt until well combined. Spoon or pour about 1 tablespoon of the filling into each of the pastry-lined muffin tins (you want the pastry cups to be about 3/4 full). Sprinkle each with some coarsely chopped pecans. Bake in the preheated oven for about17-20 minutes, or until the pastry has nicely browned around the edges and the filling is just set, but still a little soft in the center. (The filling does puff up during baking but will settle back down during cooling.) Remove from oven and place on a wire rack to cool for about five minutes before removing the Pecan Tassies to finish cooling on a wire rack. Pecan Tassies can be frozen. 1. In three separate containers (use rectangular tupperware or pyrex loaf pans), mix jello package with 1 cup of boiling water. Stir each until dissolved and then refrigerate until firm (at least 4 hours, or overnight). 3. Spray a 9x13-inch pyrex pan lightly with nonstick spray. Use a metal spatula to scoop out the jello squares and place them into the prepared pan. Mix the colors up so they're not bunched all together. 4. In a separate bowl, add 1/2 cup of cold water. Sprinkle in 2 envelopes of gelatin and stir. Add 1 1/2 cups boiling water to the bowl and stir until dissolved. Stir in the sweetened condensed milk and let cool. 5. 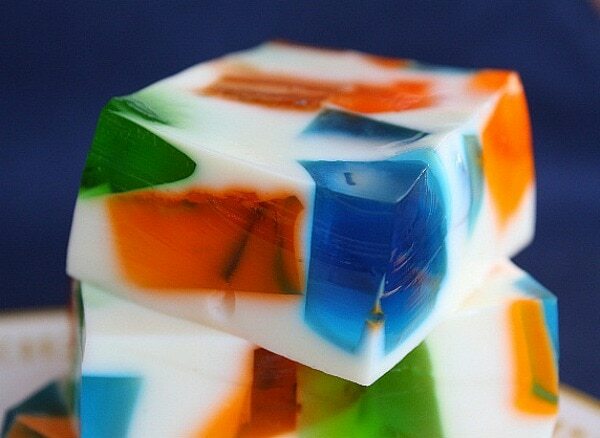 Pour the white gelatin mixture over the cubes of jello and let it fill up the pan. Refrigerate overnight. Slice the jello into squares and serve. These are firm enough to serve on a platter as a hand-held dessert. *Because I wanted to copy the look of what is usually found in sea glass, I used orange, lime and blueberry jello. The blueberry jello only comes in a 6-ounce package, so you'll need to divide it in half. You can certainly use whatever flavors you'd like. In our area you will be able to find a great variety of vegetables at the farmers market. From string beans, tomatoes, zucchini and more are all available. This casserole recipe I am sharing today will allow you to use all the veggies you have in your garden or purchase at the farmers market. Potatoes, onions, garlic, tomato, cauliflower, and zucchini will all be found in this amazing recipe. Preheat your oven to 400 degrees. Coat an 8x8" square pan or dish with part of the olive oil. Layer the bottom of the pan with the potatoes, then top with some of the garlic, onion, vinegar, salt and pepper. Next, layer the sliced tomatoes, then the zucchini plus more of the onion, garlic, vinegar, salt and pepper. Next, the cauliflower and anymore onion and garlic you might have left, plus the rest of the olive oil and more salt, pepper, and vinegar if desired. Place dish into oven uncovered for 20 minutes. Next, put the dish in the broiler for 3-5 minutes or until roasted to desired blackness. 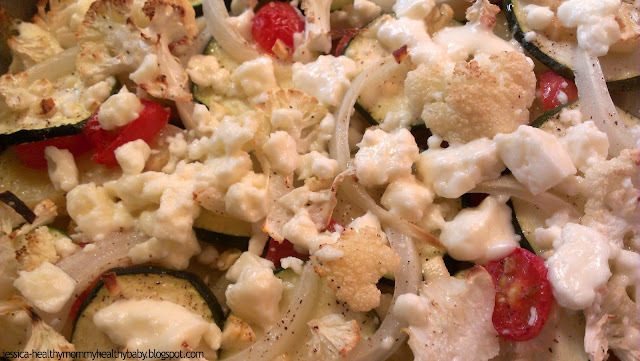 Lastly, top this casserole with as much crumbled feta as you'd like and place back in the turned off oven for 3 minutes until feta is slightly melted. Serve immediately. This would be a great side dish with just about anything or as a main course for a small family or couple. We had it with some steamed broccoli that was about to turn, and it would've been really good with some warm, crusty bread. The fresh veggies mixed with the garlic and tangy vinegar leaves a taste compared to none. The feta cheese offers an additional yummy taste. 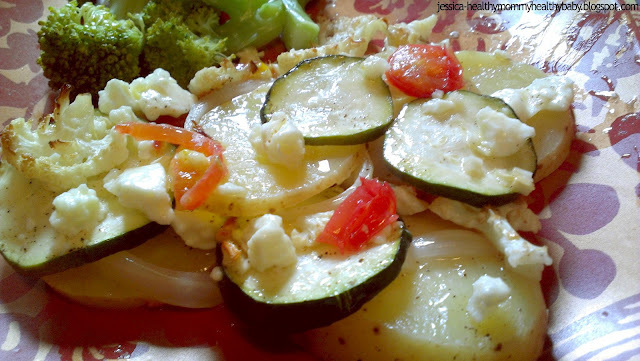 If you choose you can change feta for mozzarella or goat cheese or your favorite for a recipe like this. Breakfast this morning was spent with my hubby and grand-babies. This morning we went to a local restaurant and enjoyed fresh made biscuits, bacon, gravy and potatoes. The to do list was not a long one as tommorow is very full. We took the grand-babies to their moms after breakfast this morning, we checked on my sister and her son, and then returned back home. At home the usual was done including laundry, dishes, and today I took extra time and did some blogging. The weather outside was hot and humid. Made it very hot day but not truly to bad. Glad the 100 degree days has not made it yet. Looks like in a couple of days we will cool a bit down and get more rain.